Edible Gardens and Food Forests Delicious by Design. Whether it's a traditional vegetable garden that is dedicated to a particular area in your yard, or a landscape that weaves vegetables, fruits and herbs throughout your garden, creating edible gardens are some of our favorite projects here at Equinox. Well designed edible gardens combine beauty and artistry with practical foods that homeowners love to eat. Perennial herbs provide ongoing culinary delights year after year. Fruit trees bring beauty, texture and seasonal shade to your landscape. Vegetables, such as artichokes and kale add gorgeous foliage and provide you with an abundance of vitamins in your diet. All of it can save you hundreds of dollars in grocery bills a year. We have studied how to design and maintain edible gardens and know from our experience that the secret to growing a bountiful and vibrant garden lies in the combining of vegetables and fruits with herbs, perennials and flowers. Done properly edible gardens attract beneficial insects, repel destructive insects and create the ideal environment for each edible to thrive. Give us a call when you are ready to get your edible garden underway. FOOD FORESTS are gardens modeled after mature hardwood forests, designed with multi-leveled canopies of plants and trees to take advantage of varying sun exposure throughout the day. They are healthy ecosystems of edibles that are self-renewing, self-fertilizing, and when mature, self-maintaining. The upper canopy in a food forest is made up of nitrogen-fixing trees which create shade that helps prevent weeds from growing underneath where no soil is left bare. The middle canopy consists of fruit and nut trees. Beneath that is the edible shrub layer that includes bushes such as raspberries or blueberries. An edible vine layer also plays a part in growing foods such as kiwis, grapes or runner beans vertically. A ground layer is made up of edibles like strawberries and chamomile. And lastly there is a bulb layer within the soil containing plants such as garlic and onions. 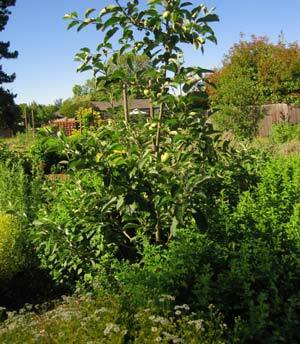 Plants within a food forest are grouped into guilds that assist each other in growing. Each guild consists of nitrogen fixers (plants that take nitrogen out of the air and send it into the soil, making it available for use by the surrounding plants) dynamic accumulators (plants that send their roots deep into the sub-soil and extract minerals such as calcium, drawing it up to the topsoil) insectary plants (which attract beneficial insects and pollinators critical for food production) and mulching plants (which drop their thick leaves onto the ground, creating a natural blanket for plants). Together they work to symbiotically and thrive. If you would like to artfully integrate edible plants throughout your landscape, please call us at (415) 456‑6480 in Marin or (707) 789‑9786 in Sonoma to arrange for an appointment. "The whole Equinox team have created an amazing sanctuary and feast for the senses. It was a pleasure to have the crew here every day, and they were always honorable in their dealings with us. They did a terrific job and I highly recommend them."